Robson Street is Vancouver’s most famous shopping street and not without reason. In a three block stretch, between Hornby and Bute Street, you’ll find dozens of shoe stores, clothing stores, restaurants, gift shops, lingerie shops, hair salons, candy stores, along with the usual tourist places: souvenir shops, currency exchanges, cheap eats and luggage stores. Some big international name brands are here: Ferragamo, Armani, Club Monaco, Guess, BeBe, Zara, Laura Ashley, Banana Republic, Swatch, Nike, Levi’s, Body Shop, Gap, Starbucks, and Virgin Records. If you want to shop Canadian, then definitely check out Roots, M.A.C., Boys Co, Lush and Aritzia. Getting There: Robson Street is parallel to Georgia Street, Vancouver’s main downtown street, and two blocks south. You can take the SkyTrain to the Burrard Street station then walk to Robson Street. You can also drive. If you drive, park in the Eton’s parkade just south of the corner of Georgia and Howe or in the parkade (parking structure) on Alberni between Bute and Thurlow. M.A.C. is a phenomenally popular cosmetic store right on the corner of Robson and Hornby. If you want to look up-to-the-minute, this is the place to start. If you think of your face as a canvas on which to paint a beautiful woman, you’ll find everything you need here: makeup, tools and accessories, beauty products and nailpolish. For upscale clothing, try Ferragamo, Armani Exchange, Zara, BoysCo, Club Monaco and BCBG Maxazria. Tourist shops, many apparently catering to young Japanese travelers, interject themselves among the high end clothing and accessory stores along Robson. With younger shoppers, Aritzia is probably the most popular store on Robson; younger shoppers are also fond of Buffalo, Level and Below The Belt. With professional women, Jacob at 1142 Robson is the most popular; in fact, it was recently voted Vancouver’s best women’s clothing store. Moose Magnets at the corner of Bute and Robson is a very popular place. It has perfect, inexpensive gifts and toys, and it’s just a fun place to hang out and play with the toys. For real food, the two best nearby restaurants are Zin and Cin Cin Ristorante. One of the city’s favorite bargain restaurants, located on Robson is Hon’s Wun Tun House. 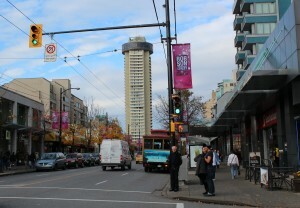 For hotels, you’ll find, between Bute and Jervis on Robson, two excellent hotels: Blue Horizon and Pacific Palisades. You can wander down Robson all the way to Denman if you want. You will be rewarded with shops, restaurants and surprises. Enjoy your trip.